It’s such a convenience being able to shop online. One of my favorite ways to shop online is through daily deal sites, like this week’s Mission Giveaway sponsor. You just can’t beat the prices and there’s almost always something you can use from the family-friendly items on zulily. zulily is the leading daily deals site for moms, babies and kids. Membership is free and zulily sales launch daily, filled with quality apparel, toys, gear and home goods at up to 70% off. Boutique brands are offered alongside national brands, giving moms something new to discover every day. Launched in 2010, zulily has become a shopping destination for millions of moms. zulily is headquartered in Seattle with offices in Reno, Columbus and London. 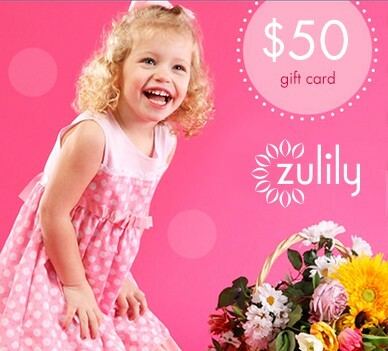 A $50 gift card from zulily is a great way to make someone smile. Use it to shop daily deals at zulily. We know you’ll find something fantastic! The Giveaway will open up on 11/5 12:01 am EST and Close on 11/8 at 11:59 pm EST. To ask about becoming a sponsor, please contact Amee or Dawn at [email protected] for details. Take a look at our Media Kit to see what Mission Giveaway has to offer.